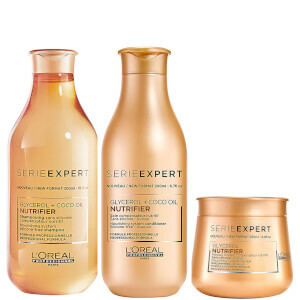 Create sleek and shiny locks with the L'Oréal Professionnel Serie Expert Liss Unlimited Shampoo and Masque Duo. The haircare pair works to replenish vital hydration and nutrients to smooth out frizz and create manageable, glossy tresses. Formulated with Oil Incell technology, which cleverly mimics the hair’s lost ceramides. This combined with the addition of highly nourishing Argan and Olive Oils means that the treatment leaves hair smoothed, conditioned and gleaming with health. The nourishing hair mask uses its key technology, Polymer AR, to wrap the hair fibre with a special anti-humidity shield, keeping it smooth and glossy while stopping frizz in its tracks. Shampoo: distribua uniformemente no cabelo molhado até fazer espuma. Enxague abundantemente. Repita se necessário. Máscara: aplique e massaje no cabelo lavado com shampoo e enxuto com a toalha. Deixe atuar durante 2-3 minutos. Enxague abundantemente.